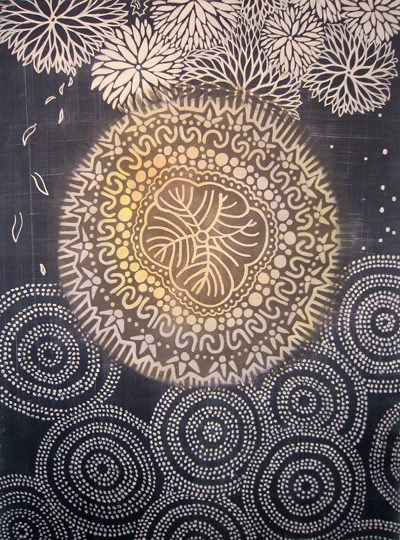 Gwen Partin’s work centers on themes about nature, landscape, birds, flowers, and pattern. She works primarily in monotype and relief printmaking. Drawing and painting in watercolor and acrylic are also of interest. Her most current work has been based on the natural themes in a method of automatic drawing as a form of meditation. These are titled mandalas as the designs are arranged with concentric radiating forms. An interest in fabrics and patterns has emerged in a new series called Peace Flags. Visit the gallery section to see more images. After 20 years as a professional graphic designer and illustrator, Gwen hung up her career hat to teach these subjects as an instructor in Visual Art and Design at Dakota County Technical College.